Since my last post, I’ve been quite busy. I’ve been reading, trying out new things, synthesising and integrating what I learnt. I’ve also been reflecting upon my learning process. Little by little, everything’s falling into place. I thought I knew… but actually I didn’t! There are so many things you need to consider when you write a post that you just can’t learn them all in just one reading session. As for tweeting, the same thing holds true. That’s why I decided that I’d deal with each issue as they crop up. I’m sure they will. 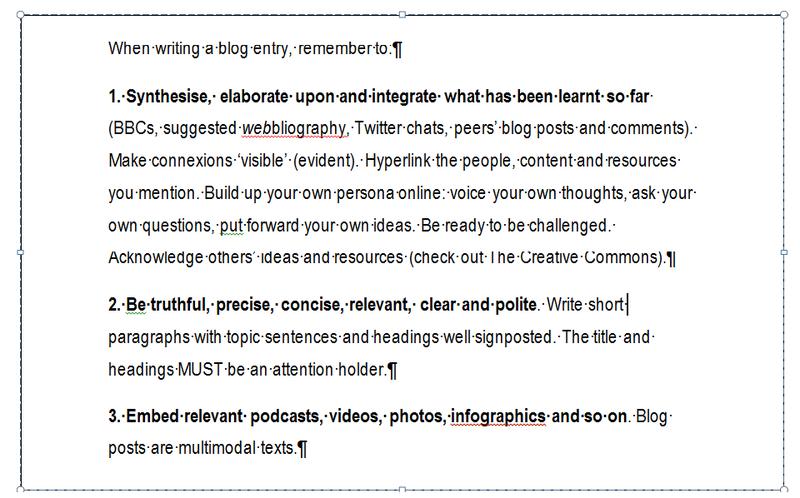 So I downloaded Sue Waters’ blog entries about how to tweet and blog effectively in PDF (See Screenshot 1 above) on my desktop for later reference and summarised what I think are the most important tips in Screenshot 2 below. After all, blogging and microblogging effectively are two digital literacy skills that develop over time. I suppose, as long as I write posts and tweets regularly, I’ll keep improving. A big THANK YOU to Sue Waters and Alison Seaman for their useful tips, timely help and endless patience! By interacting with them and the other ETMOOCers, I’m ‘re-learning’ how to ask for help when I need it, you see. Asking for help to a more knowledgeable and able peer is an empowering learning strategy that adults often underestimate. Maybe, this is so because you openly acknowledge the fact that you don’t know and you might feel exposed and vulnerable. Nobody likes feeling that way. In any case, when you ask for help your peers provide you with the scaffolding you need to move ahead in your ZPD. Or, along the lines of connectivism, your peers act as nodes and help you create connexions and by so doing you elaborate the network in which knowledge resides. The implication for teachers here seems to be that we should develop these digital literacy skills ourselves if we then want to help our students do so as well. So, from my Delicious, I picked out “PKM as pre-curation”, a blog entry by Harold Jarche, and “Content Curation for Education and Learning”, a mindmap by Robin Good, which got there from Twitter account. In “PKM as pre-curation”, Harold Jarche states that “Personal Knowledge Management or PKM is a framework for individuals to take control of their professional development while working in organizations or across networks”. Through PKM, an individual makes sense of the information available by putting it into context through a process of filtering, validation, synthesis, presentation and customisation. He adds that PKM can be turned into content curation when the whole process is carried out for an intended audience. Then, in “Content Curation for Education and Learning”, Robin Good claims that content curation has to do with picking out resources in an attempt to make sense of a topic, having a specific target audience in mind. That is, content curation involves a degree of customisation of the resources for other people. Both resources are related to the field of teacher cognition in TEFL. The sole process of content selection involves reflection and shows what the curator thinks is relevant for her/him or others. By having a quick look at what the curator stores, the underlying selection and classification processes can be analysed by having a look at the labels or tags used and how they were grouped in bundles. So over the weekend, I put Jarche and Good’s ideas into practice. I decided to use Delicious for PKM and Scoop.It for content curation. Thinking of other teachers (who like me) know very little about the topic and need to get information, I created two Scoop.It’s about connectivism and connected learning: one with supporting arguments; the other with the ongoing debate. I chose this tool because it’s quite easy to use, flexible and visually appealing. Moreover, it makes your learning evident. Basically, it’s like a front page or the cover of a glossy magazine. By having a quick look, you can get the gist of what the Scoop.It is about. If it suits your needs, you’ll keep reading. If not, you move on to something else. Yet my approach to both PKM and content curation involves and an ongoing spiral process of filtering, validation, synthesis, presentation and customisation. For instance, though I had to analyse each resource in order to determine whether they were reliable (data supported by current research, etc), I didn’t provide a descriptive comment for each comment. I’ll be doing so as I revisit each Scoop.It to make adjustments. That is, it is open-ended continuous process that, as long as others (my intended audience) get involved with it and provide their own comments, will result in a feedback loop. However, something doesn’t seem to be working with the Scoop.It with the ongoing debate. Compared to the one with supporting arguments; it’s received very few visitors. I wonder whether up to what extent what Caleb Kelly calls “The TEDification of ideas” is happening here. Maybe, it’s not groupthink but a failure to spread the word about the Scoo.It. So I´ll re-tweet it and see what happens. In the meantime, I’ll keep on working with the theory. Borg, S. (2003). “Teacher cognition in language teaching: A review of research on what language teachers think, know, believe, and do”. Language Teaching, 36 (2). pp. 81-109. ISSN 1475-3049 PDF (317Kb). Retrieved 28th January 2013 from: http://eprints.whiterose.ac.uk/1652/. Siemens, G. (2004). “Connectivism: A Learning Theory for the Digital Age”. (update 5th April 2005). Retrieved 28th January 2013 from: http://www.elearnspace.org/Articles/connectivism.htm. Hi - i really like this post. a good amount of reflection and cross referencing etc. i'm going to take a look through your scoops after this. 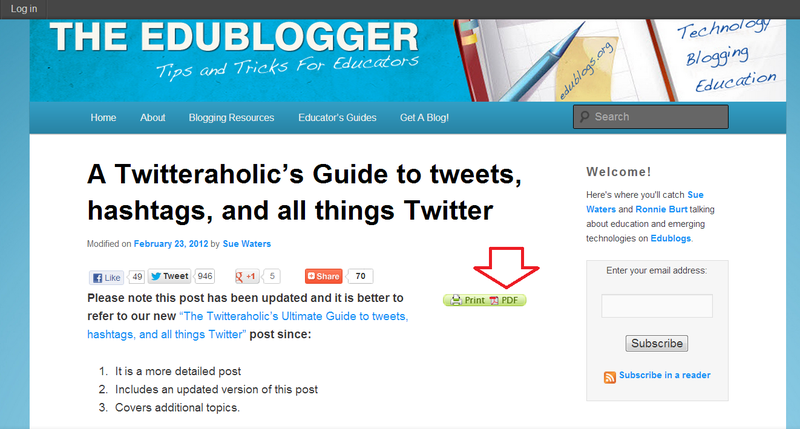 a little note - there are a lot of links and i found it hard to know what i should click or what i needed to click. Hi Caleb. Thanks for reading my post and writing your comment. Sorry, for the “link issue”. I’m going to be plain honest; I don’t usually link my posts the way I did it in this post. My criteria go like this. Since I don’t know who might read my posts, I try to write them assuming that the reader may have almost no prior knowledge about the specific topics I’m talking about. Then, for the sake of space, as long as it’s possible, I use hyperlinks with definitions, the titles of posts and documents. Most of the definitions were linked to Wikipedia, something I wouldn’t have ever done if I’d had to hand in the post to an academic institution in my country. But within ETMOOC, it seems to be the most natural thing to do. The thing is that, as I kept reading the tips about blogging, I realised that, for example, I’d never linked authors when I should have. So maybe, yes, I’m overdoing the hyperlink thing. Hope to strike a balance over time. Any rule of thumb to suggest? I answered the question you asked me on Google+ directly there. Thanks for your comment. I must reckon I’m still trying to ‘cultivate’ and ‘develop’ my own voice. Let’s see how much I can improve. Thanks for your support. Hope to meet you on Twitter chat.